Future historians of drug policy will appropriately regard the recent legalization of recreational marijuana in Washington and Colorado as a significant reduction in U.S. law enforcement’s role in cannabis regulation. Yet that marijuana enforcement policy shift had been underway for a lot longer than many people realize. The chart below presents 2007-2012 FBI Uniform Crime Reports data on marijuana possession arrests and National Survey on Drug Use and Health data on aggregate days of American marijuana use*. To put the two lines on the same scale, aggregate days of marijuana use are reported in 10,000s. The most striking feature of the data are that the two lines are going in opposite directions. The net result is a 42% decline in marijuana possession enforcement intensity (i.e., the number of arrests per day of marijuana use). Americans’ marijuana use went up by almost 50% just from 2007-2012. This sharp increase in the population’s total days of use has been driven less by the increased number of users than by the big increase in the number of individuals using heavily (e.g., smoking every day or nearly every day). That growth in use meant there was a large increase in police opportunities to arrest people for marijuana possession. But marijuana possession arrests have instead been falling as numerous states have passed decriminalization laws (with for the first time in U.S. history, no White House opposition) and/or created loosely-regulated medical marijuana systems. (1) U.S. 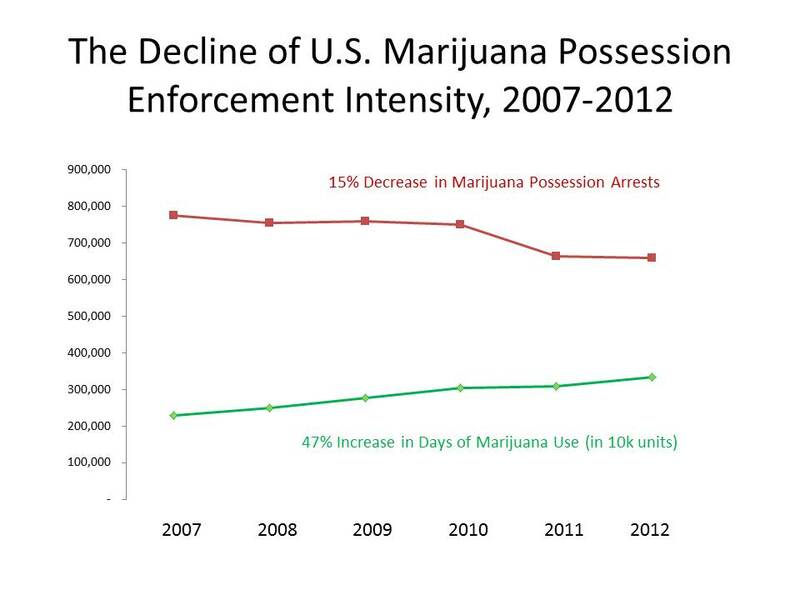 Marijuana possession enforcement intensity had become light even prior to the passage of legalization in two states. As of 2012, the average American once-a-week pot smoker would expect to be arrested for possession about once every century. This reality isn’t evident when one focuses just on the number of arrests, or on how arrests compare to some irrelevant standard (e.g., number of arrests per minute or the percentage of all drug arrests that are for marijuana). Conclusions about how intensely a crime is being policed can only be drawn in the context of information on how often that crime is committed. Six hundred fifty thousand arrests is a big number in the abstract, but relative to over 3 billion days of marijuana use, it’s small. That why the U.S. can have a large absolute number of marijuana possession arrests yet at the same time be policing marijuana at a less vigorous rate than do most developed nations. (2) There is no evidence of “net-widening” in U.S. marijuana enforcement policy. In some regions, such as New South Wales, Australia, reduction in criminal penalties for marijuana use led to an increase in arrests. Apparently, Australian police officers who previously felt penalties were too tough began feeling comfortable widening their enforcement net to intervene in more cases of marijuana use. This phenomenon has not been replicated in the U.S., where severity of penalties and number of arrests have been falling in tandem. (3) Changes in official marijuana policy are often a formalization of what has already been evolving on the ground. The creation of recreational marijuana markets in Washington and Colorado (with some other states likely to follow) is in one sense qualitatively new. Yet it is also the culmination of an established trend of rapidly declining law enforcement involvement in the regulation of marijuana. That’s one reason why it’s often hard for observers to determine whether new drug laws have a unique causal effect or are more a ratification of informal policies that were already in place. *My thanks to Dr. Beau Kilmer and his team at RAND for providing me with days of use data.